« Send Virtual Gifts On Facebook And See Them Turn Real! 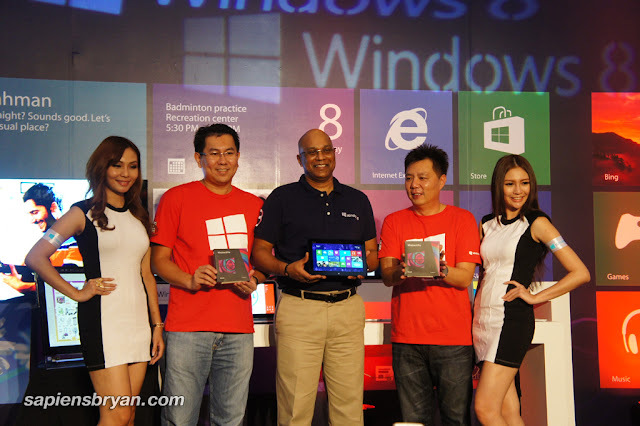 Microsoft officially launched its latest and much awaited operating system Windows 8 in Malaysia at Lowyat Plaza last Monday. Windows 8 introduces a beautiful new user interface designed specifically for touch and is designed for a no-compromise experience for work and play across various device form-factors. The new Metro-style Start screen in Windows 8 is customized with live tiles and provides a fast, easy way to view and interact with all your favorite apps, people and content. Live tiles provide a glimpse into the information you care about most, all at a glance. Thousands of apps are already available from the new Windows Store as well as many local apps such as The Star Online, AirAsia, Genting Resort World, iProperty and DiGi. 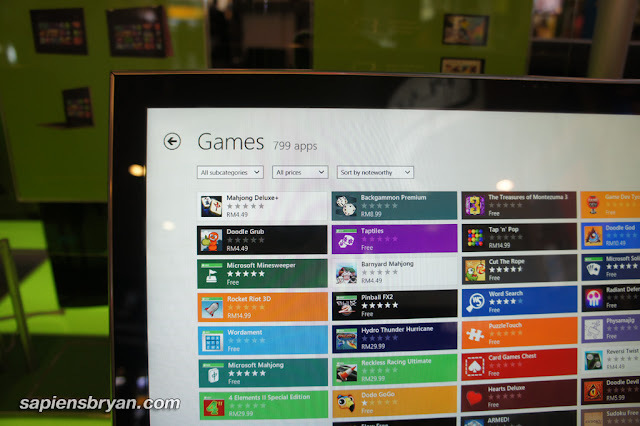 The new Windows Store is cloud connected, which means that your settings automatically follow across your Windows 8 devices and the purchased apps can be downloaded on any Windows 8 device. the ability to join domains, process Group Policy, and so on. Assurance. It includes all the capabilities of Windows 8 Pro, plus premium features such as Windows To Go, DirectAccess, BranchCache, AppLocker, VDI, and Windows 8 app deployment. 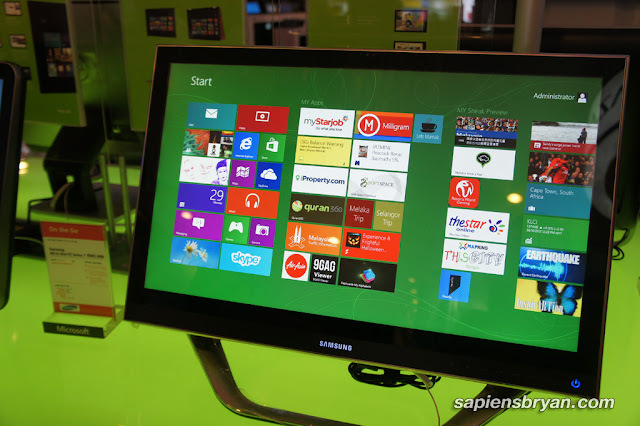 Many Windows 8 devices were showcased at the launch ranging from tablet, to laptops, as well as desktop-based All-in-Ones models. View the photo gallery below for photos of each model. Consumers will enjoy Windows 8 which comes pre-installed through the stunning array of All-in-Ones; touch-optimized laptops and ultrabooks; and even new hybrid form factors such as convertibles and tablets, made available at all major retail outlets from partners such Acer, Asus, Dell, Fujitsu, HP, Lenovo, LG, Samsung, Sony, and Toshiba. The Windows Upgrade Offer provides consumers who buy an eligible Windows 7 PC the option to purchase a downloadable upgrade to Windows 8 Pro for an estimated retail price of just around RM50 (US$14.99) during the time of the promotion. This program is available for consumers buying new Windows 7 PCs that are preinstalled with Windows 7 Home Basic, Home Premium, Professional or Ultimate and include a matching and valid OEM Certificate of Authenticity. The Windows 7 PC must be purchased new during the eligibility period of 2 June 2012 to 31 January 2013 and redeemed before the program expiration at the end of February 2013 at the online Windows Upgrade Offer website. Consumers who register for the Windows Upgrade Offer will be able to download Windows 8 starting 26 October 2012. The upgrade can be installed on any eligible and compatible Windows PC and comes with 90 days of support from Microsoft.